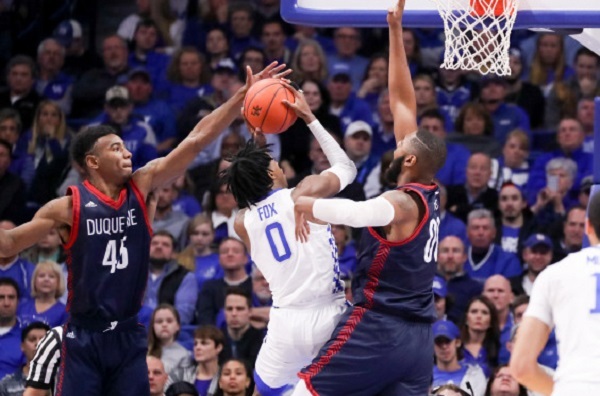 The second-ranked Kentucky Wildcats, behind freshmen Micheal Monk and De’Aaron Fox, routed the Duquesne Dukes 93-59 on Sunday night at Rupp Arena in the Bluegrass Showcase in Lexington, KY. The Wildcats (4-0) led 50-23 at halftime and led by as much as much as 39 points. Kentucky shot 46.1 percent to the Dukes 30.1 percent and outrebounded Duquesne 49 to 32. Kentucky forced 18 Duquesne turnovers and blocked 10 shots as a team. Fox had 16 points and Monk scored 14 for the Wildcats, who figure to be the top ranked team in the country when the new polls come out on Monday. Another Kentucky freshman, Edrice Adebayo added 12 points, eight rebounds, two blocks and two steals. Emile Blackman led the Dukes (2-3) with 13 points in the loss. The only other Duquesne player who scored in double figures is Tarin Smith. The Dukes will next host Tennessee Martin at the AJ Palumbo center on Wednesday evening, while the Wildcats host Cleveland State on Wednesday afternoon.